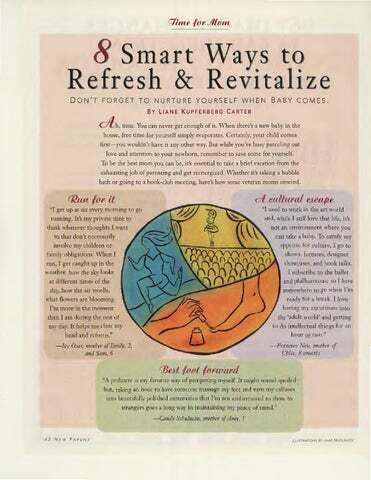 Smart Ways to Refresh & Revitalize DON'T FORGE T TO NURTURE YOURSELF W H EN BABY COMES. first-you wouldn't have it any other way. But while you're busy parceling out love and attention to your newborn, remember to save some for yourself. To be the best mom you can be, it's essential to take a brief vacation from the exhausting job of parenting and get reenergized. Whether it's taking a bubble bath or going to a book-club meeting, here's how some veteran moms unwind. ell eultum1 eJell1!e "I used to work in the art world and, while I still love that life, it's not an environment where you can take a baby. To satisfy my appetite for culture, I go to shows, lectures, designer showcases, and book talks. I subscribe to the ballet and philharmonic so I have somewhere to go when I'm ready for a break. I love having my excursions into the 'adult world' and getting to do intellectual things for an hour or two."